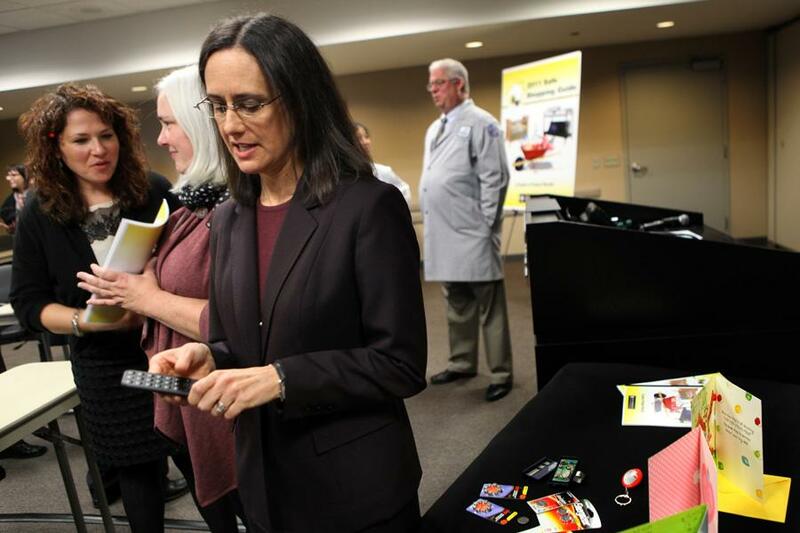 Illinois Attorney General Lisa Madigan holds a press conference in Chicago in 2011. Madigan filed a lawsuit against the nation’s largest student loan provider this week. Illinois Attorney General Lisa Madigan filed a lawsuit Wednesday against the nation’s largest student loan provider and another money-lending corporation for allegedly engaging in risky and deceptive lending practices. Madigan filed the lawsuit against Navient Solutions, Inc. and Sallie Mae Bank. Navient, which was part of Sallie Mae before the company was divided into two separate entities, became the loan servicing company of Sallie Mae in 2014. The lawsuit alleges the two entities offered risky and “designed to fail” subprime loans over several decades to students across the country, according to a statement from Madigan’s office. The lawsuit also alleges the loans carried high interest rates and fees and were mostly given to students at “poorly accredited” for-profit schools. The federal Consumer Financial Protection Bureau also filed a lawsuit against Navient on Wednesday for allegedly cheating borrowers out of their repayment rights. Madigan said Sallie Mae’s conduct was similar to the behavior of the country’s largest subprime mortgage lenders that led to the financial crisis in 2008. The lawsuit also alleges Navient did not provide adequate help and information to students — both in Illinois and nationwide — struggling with its risky loans, and Madigan claims Navient and its debt collection companies misled borrowers about their options once loans had defaulted. “In spite of encouraging borrowers to call Navient for help when they were struggling to pay their loans, Navient repeatedly failed to tell those borrowers about affordable repayment plans that were available to them,” Madigan said. Madigan’s lawsuit is seeking compensation for all borrowers affected by Navient’s alleged misconduct and asks for all contracts or loan agreements between the loan provider and Illinois to be reworked or rescinded, according to the statement. About one in four student loan borrowers across the country have loans through Navient, according to the CFPB. Navient said in a statement that the allegations against it are “unfounded” and the timing of the CFPB lawsuit on the eve of the presidential inauguration reflects the “political motivations” of the CFPB. Natalia Abrams, founder and executive director of Student Debt Crisis, a non-profit organization started in 2012 that provides support for student loan borrowers, told The Daily the lawsuits are not only necessary, but also overdue. Navient said it will defend itself against the allegations.